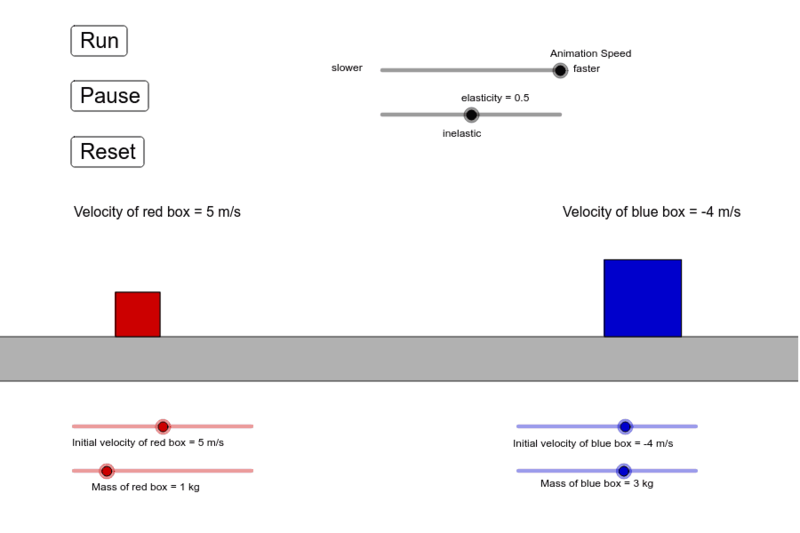 This simulatation shows a collision between two objects (the red box and the blue box) sliding on a frictionless surface. Use the sliders at the bottom to adjust the masses and initial velocities of the two boxes. Use the sliders at the top to adjust the speed of the animation and the elasticity of the collision. Press "Run" to start the animation, press "Pause" to pause the animation, and press "Reset" to reset the time to zero. Momentum is conserved in all collisions, but kinetic energy is only conserved in totally elastic collisions.